I'll tell you what little I know about the subject. 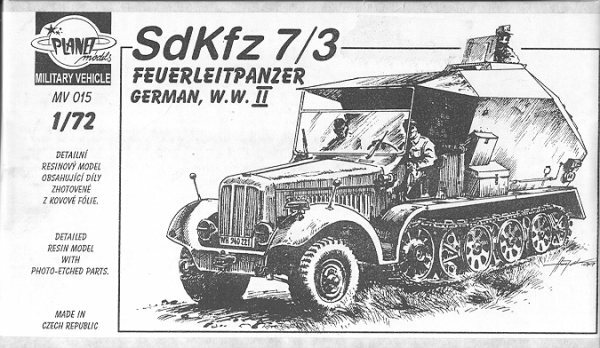 Most of youmay already know that the SdKfz 7 was an 8 ton Krauss-Maffel half track. Thisvehicle was most useful for pulling heavy artillery pieces and for helping toget stuck tanks out of their predicament. Later, as tanks became heavier, alarger half-track was required and this was the Famo. But that is another story. This particular version of the SdKfz 7 was built for a specificpurpose. That was to tow the Meilerwagen and A4 missile as well as to be theblockhouse for when the missile was fired. This made the V-2, as it was commonlyknown, a particularly mobile weapon. In fact, so successful was thiscombination, that very few of the thousands of V-2s fired in this manner wereactually found and destroyed prior to launch. The kit consists of a great number ofresin parts that are bagged into separate compartments to keep them from beinglost or broken. For this reason, I have decided not to separate them from thebags and spread them out for this preview. Especially as I don't want to loseany of them before construction starts. As you can see, there are a couple ofdifferent colors or resin used, though I don't think that makes any difference.The parts are crisply molded and appeared to be free of any flash. Most of thebits are the idler wheels, there being 28 of these and they are differentdepending on if they are inside or outside, left or right side. The most massive chunk of resin is theblockhouse part itself. This is one large casting with shallow openings at thetop and back for some etched metal bits. All of these pieces have resin blockson them with the major body parts having very large ones. The one for the frontpart of the body seems particularly large and since it has a curve in it will bemost difficult to remove. The rest of the parts don't seem that bad, thoughthere will be a lot of sanding needed before this kit is completed. The other pieces are an etched metal fretfor hatches, steering wheel, pintles, and windscreen. 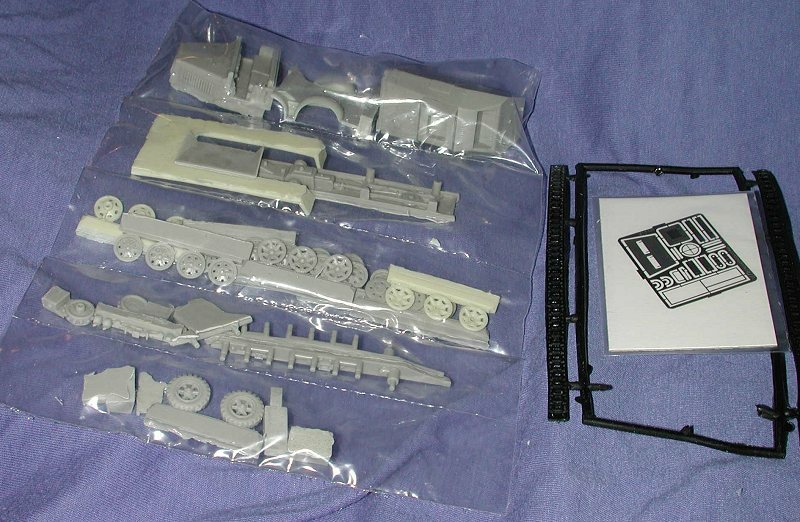 The tracks are two piecesof softish plastic, similar to old Tamiya kits. Not sure how well these willwork, but I'll find out. Personally, I would have liked to have seen the tracksas injected plastic sections, but not sure how well that would have worked. The instruction sheet is adequate to thetask showing five construction steps. Much of the time will be spent sanding andconstructing the wheels/tracks. Once the main chassis is done, the rest shouldbuild up quickly. The small painting guide shows the overall color to be sandyellow. Again, no decals are provided and you'll have to make the windshield outof clear acetate. Overall, it looks like it will build intoan impressive kit and should go perfectly with the previously done Meilerwagen. Review kit courtesy Thanks for your support. If you would like your product reviewed fairly and quickly by asite that averages over 2,000 visits a day, please contactme or see other details in the Note toContributors.